Faye was born a spring morning and was the joy and hope of her parents, she gained the traits of good and virtuoso. These were excellent traits for a sim female growing up in Castle Keep, she would surely have a bright future. It was unusual that a low class sim was able to gain such good traits at birth and the rumors about the wonder child spread in town quickly. Anne and Bill Fisher had a perfect working schedule to raise a child, Anne got up at the crack of dawn and worked at Aeuscilapius’ Health Center until the afternoon and Bill would stay home and take care of Faye. When Anne returned home she would cook a warm meal for her family before Bill left for his evening job entertaining the crowds of Castle Keep. Thus, life passed by one day just as the other and it seemed like the Fisher family had gained a sense of harmony between hard work and family life. Bill had gained some fame working as a musician in the stages of down town Castle Keep, it wouldn’t get him an audience with the King, but people knew who he was and would occasionally ask him for an autograph. Seeing that his daughter was born with the virtuoso trait made him think that maybe it was a good career choice for her, she would be able to do everything he did, but reach the top much faster. She could definitely go far, even though she came from a humble fishing family. Her traits were attractive enough, she could be married off to some well off family, at least a merchant family. A married merchant woman was not allowed to work in Castle Keep, so she’ll have to choose. Either way, Bill was sure it was possible and decided to do everything he could to make her rise in the social ladder. This also meant he and Anne should try for another child, that was able to take over the household. Anne missed her family in the Kingdom of Camerina very much, she wished her grandmother was here to meet Faye and that Faye would visit her lands and learn about her culture. Being a mother gave Anne a whole new happiness and meaning, she felt less alone in this strange land. Now that she had Faye she had someone like her, another foreigner with a different heritage from the rest of Castle Keep and this thought made her feel less lonely. Life had taken an unexpected turn for the better it seemed, with the birth of Faye harmony had entered in the house and Anne and Bill were simply happy. They didn’t cease to be an odd family and they would more than often choose the less traveled path, but it seemed like the world had become brighter and gentler to be in. If another child was to come, it was welcome, but there was no rush, they were busy living in the moment. A second son was born to the Le Peasant family, he was given the name of Burleigh by his parents, and the traits of grumpy and heavy-sleeper by the Watcher. Peasants of Castle Keep endured great hardships, they worked from dawn to dusk and had little time for leisure. This way of life meant they could not take care of their health and education, leaving their children with less than mediocre traits. Caldwell grew up into a toddler, with his two sons, Mark was sure on the way to achieving his lifetime wish to see 5 of his children grow up into teenagers. Still, the Watcher’s ways were mysterious and a child could be taken from the parents without a warning. 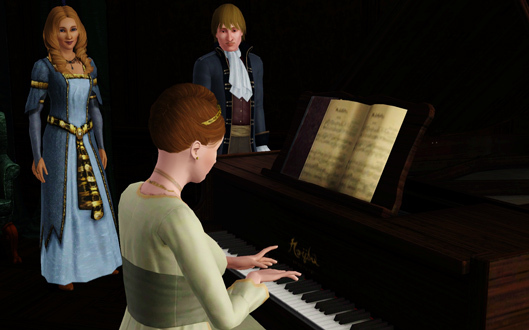 Mark was a sim of family and although he wished he had more time to take care of them, the time he spent with his family was of great quality. Even days when he was exhausted from work, he would make the time to care for them. As part of his duties as landowner, lord d’Angerville did regular inspections of the premises he owned, which meant paying visits to his tenants. The Le Peasant’s were clean and organized farmers that seldom heard any complaints from their master. However, Francis d’Angerville enjoyed doing thorough inspections at the Le Peasant household, mostly because it gave him a chance to glance at Mary. It was well known around the lands, that she was the most beautiful sim in Castle Keep. Of course, lord d’Angerville had not the guts to make a move on the girl, but he at least got to look at her. In spite of the hard life they endured, Mark and Mary were happy. They didn’t ask the Watcher for much, some food on the table and health and strength to be able to work the lands. Mary hoped for a bright future for her sons, but really, she didn’t expect much, maybe someday one of them would rise to the heights of society. But if that never happened, she would be as happy as could be. Although he knew of the talk around town about the beauty of his wife, Mark did not worry much since they were happy together. He had no doubts about his wife’s fidelity and trusted her completely. He just knew it in his heart that they were meant for each other. Although Lecie’s pregnant belly had been very big at the end of her pregnancy, the Wall’s were not prepared for the arrival of not only one, but two babies. As loving parents they welcomed the addition to the family, but they now started to worry a little about their economical situation. Lecie had to cut down on her performances at the local dance square, and went to devote herself entirely to taking care of the house and family. The twins, named Randall and Ermengard, took up almost all of Lecie’s attention during the day. The boy was born athletic and artistic, suitable enough traits for a future heir to the Wall dynasty. The girl was born good and out-door-hater, these traits were considered suitable for a girl, but Lecie secretly hoped that she would grow up to exert herself in someway, and was certainly going to work for it. With the arrival of the twins, Elmer felt it was crucial that he excelled at his job, he had to work every case much better and meticulously in the hope of solving it faster. He put a reasonable amount of time into working his network of clients to get even more cases, it was all about the small details, listening to the client and really looking for clues. This took a lot of energy, but it was essential that he was capable to provide for his young family and make a respectable name for them. Bega grew up into a toddler, and while Lecie had very little time for her oldest daughter, taking care of the twins and the household, she tried to teach her some musical skills whenever she had time. The poor child grew more introverted with the arrival of her brother and sister, the truth was that her parents didn’t have enough time to give her the attention she needed. That was the curse of the oldest child, suddenly forced to grow up and left many times to fend for themselves, while the parents were busy with the younger ones. The work as a private investigator had certainly many different aspects. Whenever he could, Elmer read books and exercised his intellect, he knew his mind was an important contributor to his success. If he wanted to keep solving cases he had to keep it sharp. Unfortunately with all the noise that raising three young children meant, it was hard for him to find a quiet moment. He would lock himself in the studio he had arranged for himself, but it was hard to focus on his work knowing everything there was to attend to in the household. The days were long at the Wall household. The young family had grown very quickly and suddenly and Lecie and Elmer did everything they could to make things work. They worked hard and there was a great pleasure in having a good nights sleep after a long day. Without any help from servants, life as a merchant was a lot of work. While Winifred looked at the noble ladies that could pursue their artistic and social interests having all the free time they wanted, she had to work hard. Some mornings this injustice made her extra grumpy and she could spend the whole day dwelling in her misery. Osmond, who had a more positive outlook on life, tried to cheer his wife up with his good sense of humor. He was genuinely happy with his life, he was doing well in his career, he had two good sons and a fantastic wife. He looked at the future and saw only how they would continue to rise as a family. Lately Osmond made sure to take care of his sons, he had taken a very strong liking to his youngest, Rudd, who shared his artistic ambitions. He hoped that this would make his wife happier and he made sure that his children were well raised and would have the same opportunities as the children of the nobles of Castle Keep, in spite of the fact that they were of a different class with less privileges. It was either very early in the mornings or very late at night when Winifred could find a minute or two to spend time in the attic where she would sculpt and paint. She would later take them to the market and sell them or export them to patrons in foreign lands. She still hoped to find a patron in Castle Keep for whom she could do commissions, but she was yet to find a noble or royal with an artistic interest. The days were long for Winifred, but after a hard days work she was happy to go to bed, albeit exhausted, if she had had the time to paint or sculpt. Still, she knew she would not be able to keep up with her work for too long, she had to find a way to increase her income so she at least could hire a maid or a nanny. Maybe if she got an audience with the Queen or another noble lady. On a quiet night, little Velma was born. The second child of the Vaughan dynasty was neither genius nor good, she was born athletic and virtuoso, two traits that were very unfamiliar to the dark castle. Lord Vaughan was sure that her virtuoso trait could help her in her intellectual development, but with the athletic trait he didn’t know what they would do. Except ignore it. Healthcliff grew up into a healthy toddler, the family had a quiet celebration at the Badlands castle without a lot of fuss. It was enough they had to throw a ball once in a while to keep their social and political relationships happy. There was not to be any excess of festivities here. The Vaughans were great collectors, their pursuit of knowledge was so fervent that they collected small animals, rocks and metals, flowers and insects. They would study them and catalogize them in large books they kept in their library. The books consisted of pages of illustrations of the specimens with detail descriptions of their observations. They shared their knowledge with other scientists and welcomed students to their halls to read the books. They kept some specimens of small animals and birds, which of course Mary de Servant had to care for. The library was a sanctuary for lord Vaughan, he truly enjoyed his collection of books and was proud of his work. Whenever there was someone over to visit he made sure to show them his works and his great collection of important books. His traveling friends would bring him books that suited his interest in natural sciences and technology. The library had actually gained a bit of a reputation and it did happen that scholars made their way to Castle Keep seeking to study a specific book that was housed in the Badlands Library. Lady Vaughan had made a friend in Queen Eleanor, who also was a bit socially awkward. 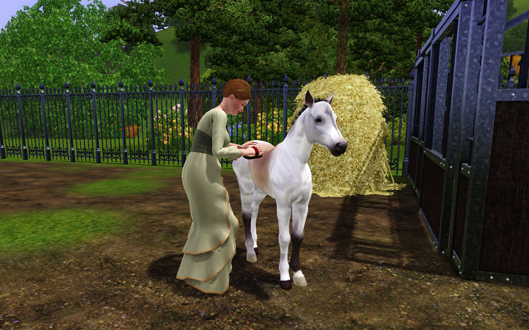 Godiva was very happy to share time with the Queen, she wasn’t the most clever sim in the Kingdom, but they had fun together. When princess Catherine was born, lady Vaughan was one of the first to receive an invitation to meet her. An heir to the d’Angerville dynasty was born, he was named Badrick and was born with the good and artistic traits. Lord and Lady d’Angerville were extremely happy, it was sure that their future as a great family in Castle Keep was secured. Francis hoped that the boy would grow to be an excellent military strategist just like his grandfather and bring glory to the family name. There was much to do at the White Castle on Valley View, with the two children, the horses, the household, the garden and the nectary, Thomas didn’t find one moment to rest. He was happy to see the d’Angerville family thrive and could already see their wealth increasing. This meant that he was allowed to find a nanny that would help out with the children and a butler to help out with the household, the good times were coming. With the children, the nanny, the butler, Thomas and Arabella all running around the castle busy with this and that, Francis could sometimes feel out of place. Lady d’Angerville had a very strong opinion on how everything had to be done, to the tiniest detail, there was very little space for Francis to have a say on anything. To make himself useful he would take care of the horses, it was something he enjoyed doing, and it was also nice to take a break and be outdoors. Little Cedrica grew up into a lovely toddler, Arabella made sure that her daughter’s education was to the standard of a princess-to-be. Mastering a musical instrument or having a beautiful singing voice was something that all young women strove for. Lady d’Angerville made sure that Cedrica was trained from young age. One would’ve thought that having one son and one daughter sufficed for a noble family to ensure their dynasty’s grandeur. For Arabella d’Angerville it was far from enough and when she felt she had recovered from her latest pregnancy she decided there was no time to wait. Without any new recruits to the Aspen Woods Monastery, Peter the Diligent was close to losing his patience. After the birth of princess Catherine he felt it was time to talk to Queen Eleanor. His intention was to leave with a promise by the Queen that Catherine would join the monastery. Peter requested an audience with the Queen and as always she received him with open arms. Upon hearing his request Queen Eleanor became concerned, she had another path envisioned for her brilliant daughter, she would make a great spouse to one of the two influential noble families of Castle Keep. However, if Catherine herself chose the holy path, Queen Eleanor was not going to stop her. Peter was not entirely satisfied, but maybe this was all that he could ask for. With that promise, he left the castle. At the Aspen Wood Monastery the quiet and pleasant life of solitude and simplicity continued. Peter the Diligent went about the chores, he took care of the garden, produced the famous monk nectar, took care of Petra the Horse. Maybe the monastery would die with him, he was getting old and if he didn’t manage to recruit someone to follow his steps this would be the end of the monastery, that was for sure. 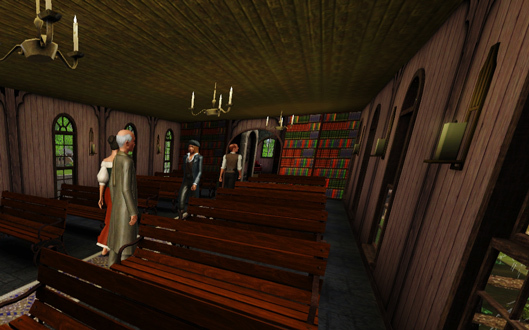 Even the weekly sermons didn’t seem to catch the attention of many sims. It was as if the times of peace had removed any spirituality from the residents of Castle Keep. 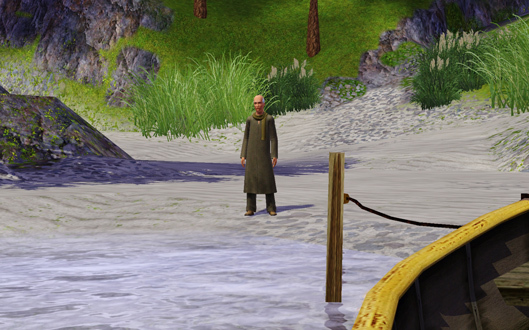 Sims weren’t concerned with how life after the reaper would be, maybe they didn’t fear death as they had once done. Peter was concerned, he had to take some measures soon, some great measures, he had to do something that would catch the eye of the sims of Castle Keep. But what it would be, that was something he had to think of. One sunny day, the answer finally came to Peter the Diligent. While he was walking along the docks at the port, he was approached by a sim who asked him if he had heard of Bartolomeo the Wise. Peter was intrigued and he was told that Bartolomeo the Wise was a great Peteran priest that was spreading the word of the Watcher very well, he was very charismatic, a quality that Peter lacked, and very liked by everybody he met. After hearing the sim talk so well about the priest, Peter decided to write to him and ask him for assistance in getting the sims of Castle Keep more spiritually concerned. Prince Edmund grew up into a toddler, the King and Queen threw a big party to celebrate their heir. While all the important residents of Castle Keep celebrated the boy by eating good, drinking well and dancing until late, the prince got to play with his beloved nanny. A nanny develops a close bond to the children it cares for, it would certainly be bittersweet to see the prince grow up and for her to leave his side. That is how life was, for now they still had some time to play together. 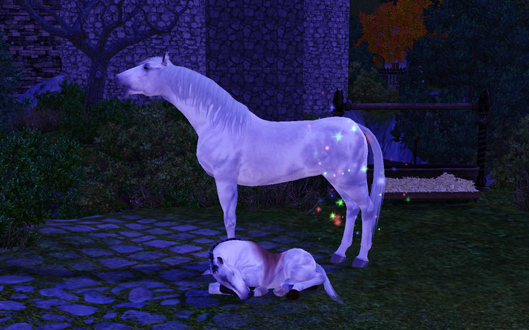 It was a clear starry night when the Royal Mare, Princess, gave birth to a little foal. Queen Eleanor gave it the name of Caesar, it was this little foal that would become a great horse to serve her son, the heir of Castle Keep. It was unfortunate that he was born untrained, but at least he was friendly. Queen Eleanor was sure that they would be able to train the little foal into a perfect stallion. The next day, it was Queen Eleanor’s turn to give birth to a child, to her mother’s delight it was a daughter and with the exquisite traits of virtuoso and genius. Surely these were the traits of a ruler, but King Edmund regretted that they were wasted on a daughter, but what a fantastic daughter Catherine would surely be. He could only hope that a good upbringing would make his son Edmund half as great as little Catherine already seemed to be. Of course, Peter the Diligent was there to bless the child, less she fall ill and be called by The Watcher. It was a time of joy an celebration in the Kingdom of Castle Keep. Queen Eleanor had delivered a healthy boy and a healthy daughter, the future looked bright with an heir to the Castle Keep dynasty. The Royal Couple celebrated by inviting nobles and celebrities from their lands to feast and enjoy the greatest entertainment in the Kingdom. One party followed the other and while everybody was concerned to impress the King and Queen with their best talents, all to secure a royal marriage in the future, the Queen herself was able to impress them with her music. 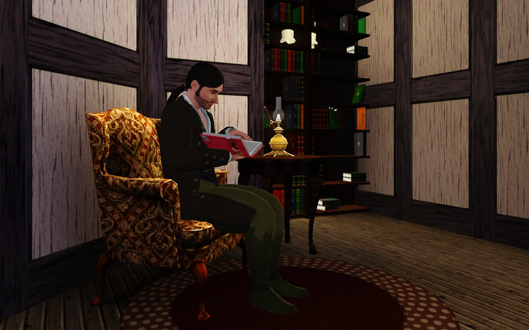 While King Edmund was a devoted father and husband, and the royal bedchamber was a place of passion between husband and wife, it was only natural that a flirtatious sim would reach a point in life when they would be tempted to seek company elsewhere. As the charming sim he was and because of his great position of power, it was hard for other sims to deny him this pleasure. He could charm any sim with his eloquent words quite quickly and the thrill it gave him was something he did not experience elsewhere. Queen Eleanor, although a bit childish, was not a fool and understood very well what was happening, still, there was little she could do about the matter and although she became more vigilant she decided to not take any action at the moment. Instead, Queen Eleanor devoted herself to the court and the Royal Household, she was loved by the people of the court and by, well, actually, by everybody in Castle Keep, there was not one sim that had something negative to say about the Queen. Except maybe that she was a foreigner, but all her other qualities seemed to overweight this small fault, that at the end of the day, was nothing she could help. To tell the truth Queen Eleanor had become quite a celebrity and might even be more loved than the King himself.